After a topsy-turvy campaign and a "tragic" week which saw their hopes of any silverware disappear, Real Madrid were all smiles again at the Bernabeu after Zinedine Zidane's return as coach was celebrated with a 2-0 victory over Celta Vigo on Saturday. "Happiness has returned to the dressing room and that's the most important thing," Real goalkeeper Keylor Navas told reporters. "The past is the past. The group is working well. I don't know if we needed a change or not but the club thought it was necessary. "Zidane has spoken to each one of us individually and now we need to be professionals and work hard." 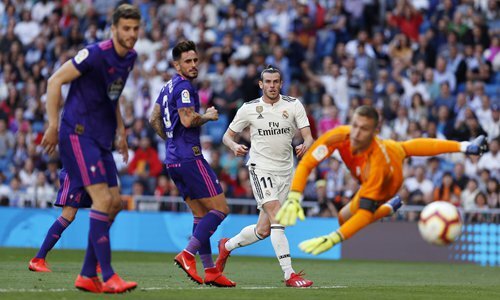 Isco gave Real a deserved lead in the second half in the Madrid sunshine and Gareth Bale further raised spirits by sealing victory later in the game. Along with Isco and defender Marcelo, Costa Rican Navas was one of the main beneficiaries of Zidane's return 10 months after the Frenchman had walked out on the club having won an unprecedented three consecutive Champions League crowns. Navas, Real's No.1 in each of those triumphs, had been relegated to second choice with the signing of Thibaut Courtois and had only made three league starts before getting the nod ahead of the Belgian against Celta. "I had not played for a very long time so I'm happy. We'll see what happens in the ­future," Navas added. "The most important thing is I worked very hard to get an opportunity and today I got one." Defender Alvaro Odriozola also spoke of a change in atmosphere with the return of Zidane, who is Real's third coach of the season after the sacking of Julen Lopetegui in October and Santiago Solari last week. Solari won his final game in charge of Real in the previous weekend at Valladolid but his fate had already been sealed by two defeats to Barcelona and the humiliating 4-1 loss to Ajax Amsterdam which ended the team's iron grip on the Champions League. "We are all very excited, we have renewed hope after that tragic week," said Odriozola. "We have to look to the future, end this season with honor and try to win the remaining 10 games. We have to stay focused on competing and not thinking about who is playing or who isn't. Instead, we all need to give 100 percent." Midfielder Dani Ceballos added, "It looks like us changing our coach worked. We have recovered some sensations we had lost and we have got the three points."